If you are looking for that calm, peaceful cheeriness of a quiet, snowy country Christmas, look no further than the Country Christmas flavored coffee. This flavored creation will tantalize your taste buds with its hints of roasted chestnuts, subtly sweet graham cracker undertones, and full-flavored Southern maple syrup creaminess. 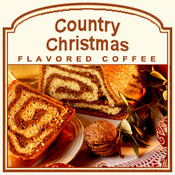 With only 2 calories in each cup, this Country Christmas creation offers your taste buds a cozy and cheery Christmas respite � even if you're drinking it in the middle of summer. Made with 100% authentic Arabica beans, this holiday inspired coffee will hit the spot with its sweetness. Roasted and shipped on the same day, the Country Christmas flavored coffee will be packaged in a heat-sealed valve bag. Let the spirit of a country Christmas melt your taste buds away!